Yesterday, the sun was shining and it was just gorgeous out. I knew that we’d be in for a few days of cooler temperatures this week, so we decided to make the most of the pretty weather and have school outside. 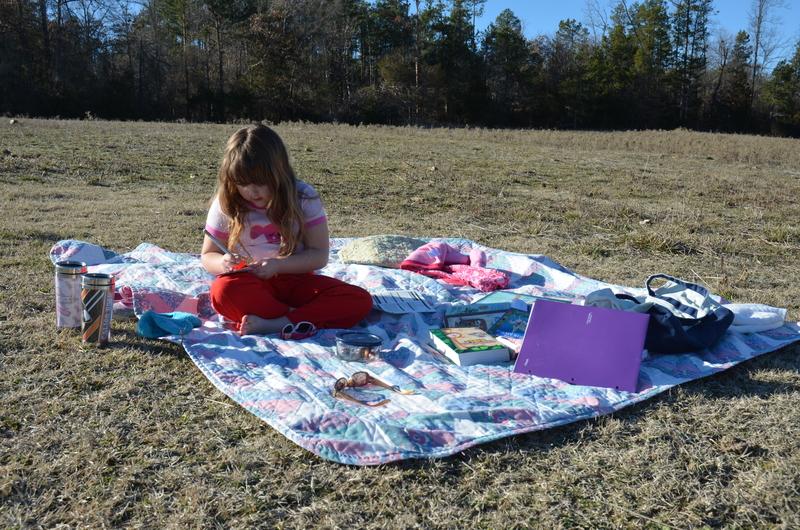 Elizabeth and I packed up a large quilt to sit on, two small quilts to cover up with, her school books, and pencils. We also took our fuzzy house slippers, sunglasses, snacks, and water. Hey, you have to be comfortable while doing schoolwork! We headed outside and down into the pasture where we spread out and read about ancient China, practiced place value, read from the Bible, and practiced reading and handwriting. As we sat on our quilt with a soft breeze blowing, Elizabeth and I looked at each other and smiled. We both agreed that having school outside is one of the best things in the world! After church on Sunday, Joey and I went for a long walk in the woods. It was so relaxing to walk, talk, and notice all the beautiful things in nature. We saw several different kinds of animal footprints, stopped to listen to water running in a little creek, and marveled at some of the taller trees that we saw. We tend to be a little low tech here on the farm and, we really like it that way. Of course, we appreciate hi tech things, and even own a few. We really enjoy things like our car, heating and cooling system, and kitchen appliances. But we also appreciate a little simpler version of life. Instead of video games, we like board games. Instead of hot rollers, we use sponge rollers (or my latest obsession…pin curls!). Instead of an e-reader, we have real, honest to goodness books. Well, I think you get the picture. So, why are we kind of low tech? Well, why not?! For one thing, it’s fun to be a little unplugged. We enjoy doing things at a somewhat slower pace. Our family time seems to be more meaningful if we all aren’t plugged in to a Kindle, I-Pad, or I-Phone. For another thing, many of the things that we use aren’t readily available on today’s market. Shopping for these items in thrift stores and antique shops is a blast! For example, we recently purchased a 1960’s “helmet” style hair dryer to use when rolling our hair. Elizabeth and I found it at a thrift shop, brought it home, cleaned it up, and it’s as good as new. We were tickled pink by our “find” and only paid $10.00 for it. You never know what you will find when shopping second hand. It can be really thrilling! Another great reason to go low tech is that you really get a chance to enjoy the things you already have. It’s fun to do a familiar puzzle or sew a dress using a well-loved pattern. Most of us have houses crammed with things, but feel like we still need to buy more. Take a look around your home, and rediscover some old things that you really enjoy. If you’re someone that’s always plugged in, try going a little low tech for a day. No, I don’t mean that you have to turn off the electricity and harness up the horses! Just try putting aside your cell phone, or Facebook, or whatever it is that you can’t seem to get away from. Look around your home and do something that doesn’t require an Internet connection. You might be surprised at how much fun you can have. If you’re someone that likes low tech things, or someone that lives a no tech lifestyle, feel free to share what you like about being “unplugged”. Right now, I’m going to unplug and get off the computer. I can hear a great book and a cozy spot by the fireplace calling my name! I’ve been thinking about you lately. As I’m sitting here listening to Glenn Miller and Tommy Dorsey spin around on my record player, I just can’t help but remember you and smile. I know that they were some of your favorites. 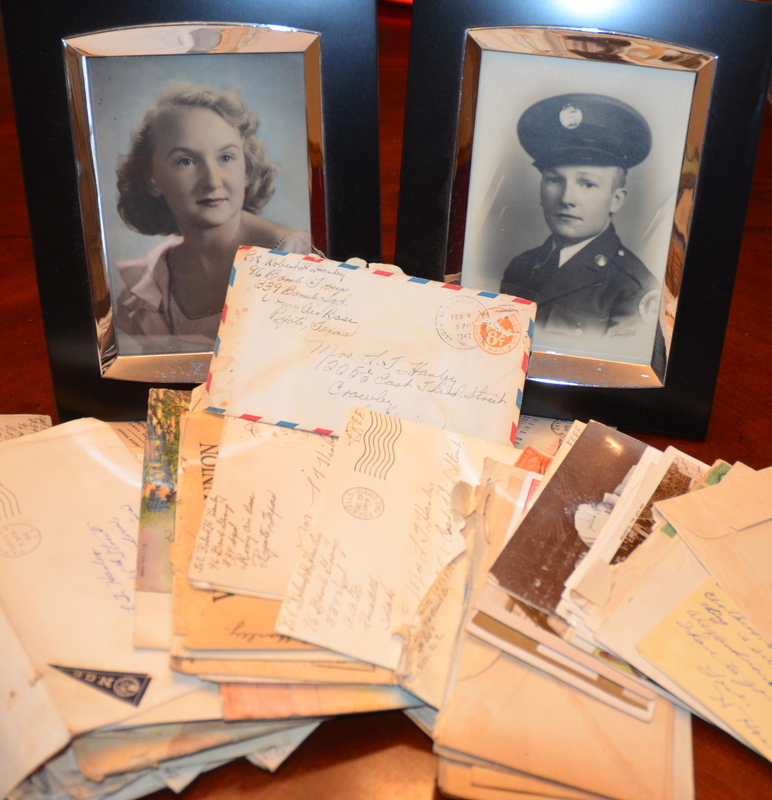 When I read your letters from World War II, it’s all to easy to picture you as a young soldier dancing to this music and enjoying a drink (or two) with a pretty girl. It sure must have been an amazing time back then with women joining the workforce, young men (and old) enlisting to go fight overseas, and the whole country turning out to support the war effort. Our generation owes so much to yours. You all may not have known it then, but you were setting an amazing example for us to follow. Your generation’s service and strength are awe inspiring. I miss you Grandpa. Almost every day, I think of you. When I hear a ball game on the radio, I can see you sitting by your bed, listening to the ball game AND watching it on television! I miss how you used to explain intricacies of life, like the way blood cells work, to me. You could make even the most technical things seem understandable. I don’t think I ever told you, but I really appreciated all the time you spent watching me ride my bike and play outside. You were one of my biggest fans. Yes Grandpa, I’ve been thinking about you. I hope, that up in heaven, Tommy Dorsey and Glenn Miller are playing, drinks are being served, and a pretty girl named Mary is waiting for you to take her on that next dance across the club floor. 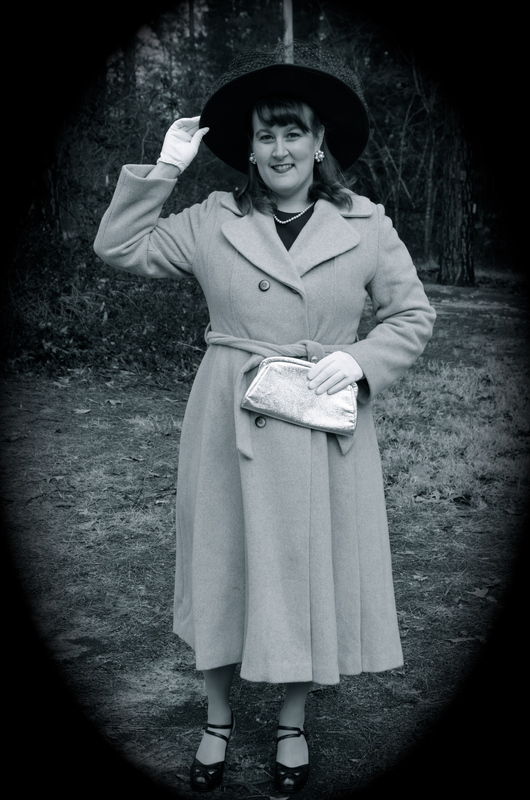 This winter, my modern old-fashioned life has taken me on a journey into the world of vintage fashion. From what I’ve seen so far, it’s quite a remarkable place. The people that dress in vintage style come from a wide range of countries and have a wide range of reasons for dressing vintage. Some of these people are vintage purists and will wear only authentic clothing and accessories from their chosen era. Other folks in the vintage set are not quite so pure and include authentic and reproduction pieces in their wardrobe. Still others, choose to accent a modern wardrobe with a few carefully chosen key pieces to give an impression of a vintage look. I find it all extremely fascinating and intriguing. History has always beckoned to me, and vintage hats, jewelry, clothes, purses, and gloves have always had their own special siren’s song. Keeping all this in mind, I guess it’s not to surprising that one cold day over the Christmas holidays, I found myself reading an online hairstyling guide about how to create 1940s victory rolls and pin curls. Of course, I just had to try this fabulous “new” look! After a little practice, I was a victory roll and pin curl pro. 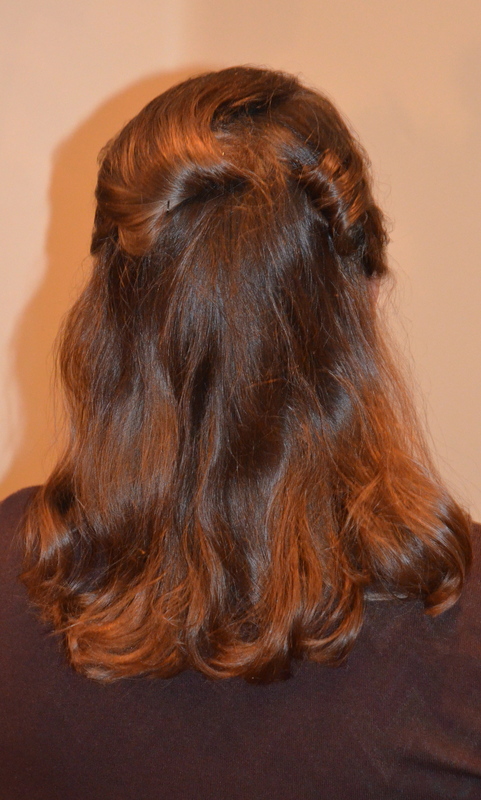 The style was very easy, and I was completely smitten with my modern old-fashioned hair-do. A back view of one of my first victory roll attempts. Now, when a girl has a fantastic new hair-do, she needs a fantastic new outfit to go along with it. So, my daughter Elizabeth (who is quite the vintage girl herself), and I headed out to shop. After thoroughly enjoying ourselves and looking through several stores, we came home with a sensible navy blue dress, a beautiful fawn colored coat, a brown hat, complete with netting, a shiny silver handbag, and a very glamourous pair of Deliso Debs peep toe shoes! Shopping for these vintage treasures is such a thrill! You never know what you will find and what kind of a life it’s lived before it came to you. Every time I wear a vintage piece of clothing or jewelry, I just can’t help wondering about it’s history. Who did it belong to? Where was it worn? How did it end up here? For example, I was doing a little research on my pair of Deliso Debs pictured above and found out that they were originally bought at a private department store all the way in Dayton, Ohio! Amazing! I am a firm believer that if you are going to own vintage pieces, you should wear them. What’s the point in having them if they’re never going to see the light of day again? When I wear them (as I often do), it’s not unusual to see a few raised eyebrows and to get some questions. When I explain that I love the vintage styles and enjoy connecting with history, people usually smile and compliment the look. Another perk is that people share their old memories with me. It’s so interesting to hear what life was like in another era. For me, wearing vintage is about making a connection with history. I love the beautiful and feminine styles of past decades. Whether it’s a 1940’s hair style, a dress from the 1950’s, or a beaded hand-bag from the 1920’s, I enjoy wearing them all. Vintage pieces are just another perfect part of my modern old-fashioned life.